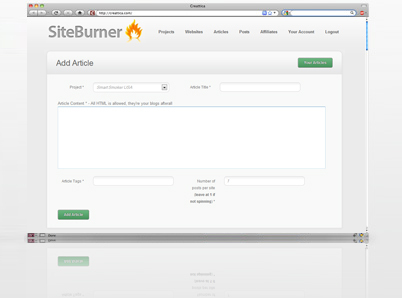 Site Burner is a unique blogging tool. Write a blog post and have a unique version distributed to all of your websites/blogs. With automatic social bookmarking and smart linking between your sites you can build up a large, and very strong network of websites. Site Burner is perfect for Internet marketers and SEO, as it can be used to build advanced and intelligent link wheels. Automatic social bookmarking Once a post is made we post the link, along with keywords, over to a series of social bookmarking sites, getting you indexed quickly and providing your posts' first backlinks. Spinning Generate thousands of unique versions of the same article by spinning. Site Burner	supports nested spinning so you can make your articles more complex. Smart linking Wrap a word in [smartlink] and our intelligent system will search for one of your relevant posts and link to it. Site Burner is careful not to produce reciprocal links so that your blogs remain independant. Lots of support platforms Easily post to custom Wordpress websites, Blogger, Tumblr, Blogspot, Wordpress.com, Blogetery, and if you're a little technical you can even set it to post to your own bespoke solution. Posts sent out over time We don't send out all of your blog posts at the same time, instead we stagger your posts over a period of time. Keep track of all of your posts Know what's been posted where and when. We store everything so you can view all posts from one central place. Use projects to keep everything organized and where you need it.